Yesterday I went up to my parents house and enjoyed a day in the dirt. I had ordered a truckload of compost to be delivered. I was expecting a morning delivery, but as my luck had it, it was a 5:30 pm delivery. So I had time to do a lot of raking and prep work, but had to scramble to get the dirt spread and turned before dark. My parent's garden plot is about 15 by 50 feet, by my guess. It is against the woods with a westerly exposure, so it gets lots of midday and afternoon sun. As the trees to the east grow, my parents have been gradually inching the garden out into the yard to get more sun. The plot has a few things growing in it now. Perennial rhubarb, and herbs oregano and sage. Also three nice rows of garlic. I had meant to order enough compost for a 2-3 inch layer, but looks like I was off by a factor of 2. It was pretty intimidating after the truck left to be standing there by an enormous pile - just me and my shovel and the setting sun. I surprised myself and did get it spread. Then I limed (10 lbs) and added a little organic fertilizer (Garden Tone, 5 lbs). And I was able to turn about half of the plot before Skippy insisted it was time to go home. The compost is dark and even and looks great. No mixed in trash, no sticks or rocks. Just very nice and good smelling stuff. I hope it will produce a bumper crop! 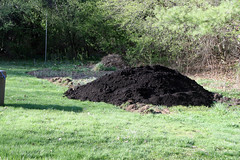 Note added: Here's the link for the compost that I added: Agresource Compost. Looks like its already pH adjusted - so I didn't need to add lime. I'm also noticing that the weeds prior to prep seem to be "sweet" soil weeds: dandelions and chickweed. Well, at least tomatoes like the soil sweet, as do peppers and zucchini. The carrots and beets may not appreciate it. We'll see. So great! 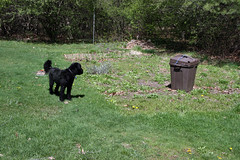 We have some compost they delivery here in the Berkshires called "Black gold" and it's just the best. Do you always add lime? 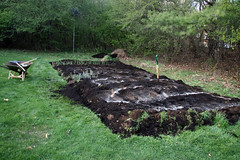 I've been adding a lot of lime (20 lb per 600 sq ft, 66 sq yd, spring and fall) to my plot since its been very acidic pH 5.5. 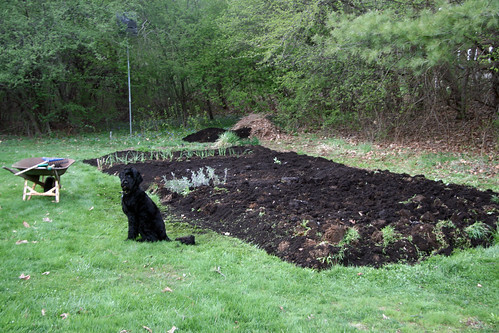 I didn't get a soil test of my parent's garden, so I just guessed it needs lime and added 10 lbs per about 750 sq ft. I don't know if compost is usually adjusted for pH of if it tends to be acidic or not. "derived from food and gelatin-producing processes" Oh, too bad, not vegetarian. 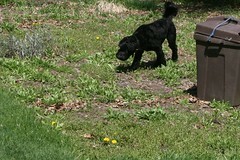 It is hard work finding a fertilizer/compost that doesn't have animal products in it. Good thing I have a compost pile. Very true. I didn't know this was a material used in compost making. And I didn't realize non-vegetable products were compostable. I looked into composting with gelatin processing wastes. Kraft Foods' Woburn MA facility delivers thousands of tons of gelatin byproduct, referred to by Kraft's predecessor as a "liquid bone slurry gelatin" to farms for addition to compost piles. It can be added in with horse bedding and beef cattle manure. The material is derived from the hides of animals, which are delivered from federally approved beef and pork processing plants, then washed, conditioned and cooked to separate the collagen and oils from the hides. The byproducts are then de-watered, collected and shipped for composting. Nothing like your own home-grown compost!